경상북도 월성군 감은사 터에 있는 감은사지삼층석탑(국보 제112호) 의 동쪽에 있는 석탑을 1996년도에 해체·수리하면서 발견된 일괄유물 중 사리 일괄품이다. 1959년에 발견된 감은사지서삼층석탑내유물(보물 제366호)인 청동제사리기와 구조가 비슷하며, 바깥을 감싸고 있는 외함과 안쪽의 사리기, 그리고 사리병 등으로 구성되어 있다. 외함의 네 벽면에는 사리를 수호하는 사천왕상이 표현되어 있으며, 사천왕상의 주변에는 구름무늬를 새겼고 좌우에는 귀신의 얼굴 모양을 새긴 고리가 배치되어 있다. 사리를 모셔 둔 내함은 기단부, 몸체, 천개의 3부분으로 이루어져 있다. 기단부의 네 모서리에는 별도로 만든 사자가 있으며 기단면에는 안상(眼象) 모양의 장식을 크게 투조하였다. 투조된 내부에는 신장상과 공양보살상이 각각 돋을새김으로 장식되어 있다. 몸체의 중앙에는 사리를 넣어둔 복발형 용기를 중심으로 사천왕과 승상을 각 네구씩 따로 만들어 배치하였으며, 외곽으로는 난간을 돌리고 네 모서리에 대나무 마디 모양의 기둥을 세워 화려한 장식의 천개를 받치고 있다. 수정으로 만든 사리병은 높이가 3.65cm이며, 정교하게 금알갱이 장식된 뚜껑과 받침, 그리고 원판 수정제받침, 금동제 투조받침 등과 세트를 이루고 있다. 이 사리기 세트는 제작기법이나 유물 형태로 볼 때 통일신라시대 공예기술의 정수를 보여주는 것으로 불교조각사와 공예사 연구에 귀중한 자료로 평가된다. This sarira reliquary (Treasure No. 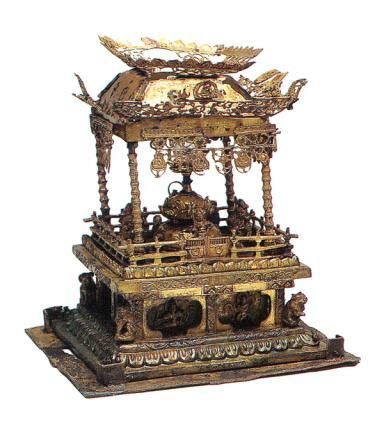 1359) was among the relics collected from the three-tiered stone pagoda (National Treasure No. 112) in the eastern section of the site of Gameunsa Temple in Wolseong-gun in the course of the work of dismantling it for repair in 1996. 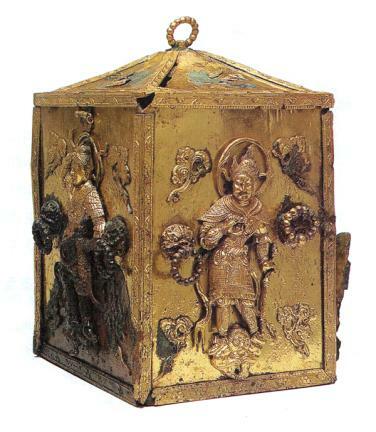 It looks similar to the bronze sarira reliquary (Treasury No. 366) found from the three-tiered stone pagoda in the western section of the site of Gameunsa in 1959. 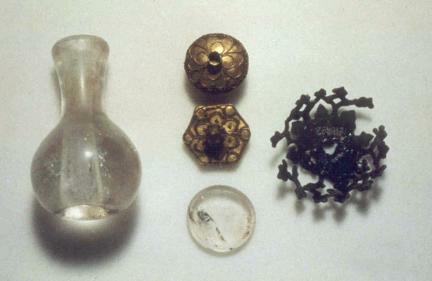 This reliquary, which contains a sarira bottle, has an outer casket. The outer casket displays the images of the Four Guardian Kings along with cloud patterns and ornamental rings inscribed with goblin face on the four sides. The inner casket is composed of platform, body, and canopy. The image of lion is placed at each corner of the platform. Each side of the platform shows the lotus petals made with a bratticing technique. Inside the bratticed part are images of guardian deities and bodhisattva carved in relief.